The Island of Thera, also known as Santorini was populated by people of the Minoan culture, located in the Aegean Sea north of Crete. The volcanic event was so large, that much of the island collapsed into the sea, killing virtually all inhabitants in that area and devastating nearby islands as well. This gigantic event was calculated in 1991 to have displaced over 39 cubic kilometers of dense rock, but a subsequent study in 2006 indicates the event was much larger, having displaced 60 cubic kilometers of dense rock! The remaining part of the island has a 200 foot thick layer of volcanic ejecta, consisting of 3 bands from the different stages of the event. This volcanic record indicates there was eruptions and large amounts of ash spewed prior to the big blast, allowing the residents time to flee to other islands, resulting in surprisingly little human casualties on Thera near the epicenter, but outlying areas were buried in ash that killed large numbers of people. A resultant tsunami struck Crete and other islands, causing more devastation to the Minoan civilization. For perspective, the Minoan Eruption was about 4 times larger than the Eruption and Explosion of Krakatoa in 1883, although the eruptions at Tambora (1815), Lake Taupe (190 AD), and Baekdu Mountain (970 AD) might have been larger. Chinese records cite a volcanic winter around 1600 BC that would seem to coincide with the Minoan Eruption, but no Egyptian records acknowledge the event, but heavy rains leading to flooding at the time may have been caused by the climatic effect of volcanic ash in the atmosphere. 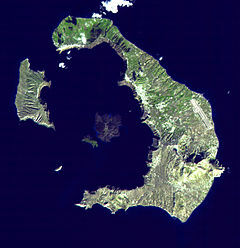 The Greek tradition of the island of Atlantis, as related by Plato, may have been based on the Island of Santorini/Thera and its sad fate, although researchers cannot yet be sure if there is any connection. The timing of the Minoan Eruption could well coincide with the events of the Exodus of the Jews from Egypt, but again, without scientific agreement on the subject. The Seventh Plague: John Martin’s painting of the plague of hail and fire (1823). Is there really a connection between Atlantis and Santorini (Thera)? Tell us what you think. Warburton, David. Time’s Up! Dating the Minoan Eruption of Santorini: Acts of the Minoan Eruption Chronology Workshop, Sandbjerg, November 2007. Aarhus University Press, 2009. Previous ArticleHeadlines: February 4, 2016: Should Ted Cruz Be Allowed to Run for President?